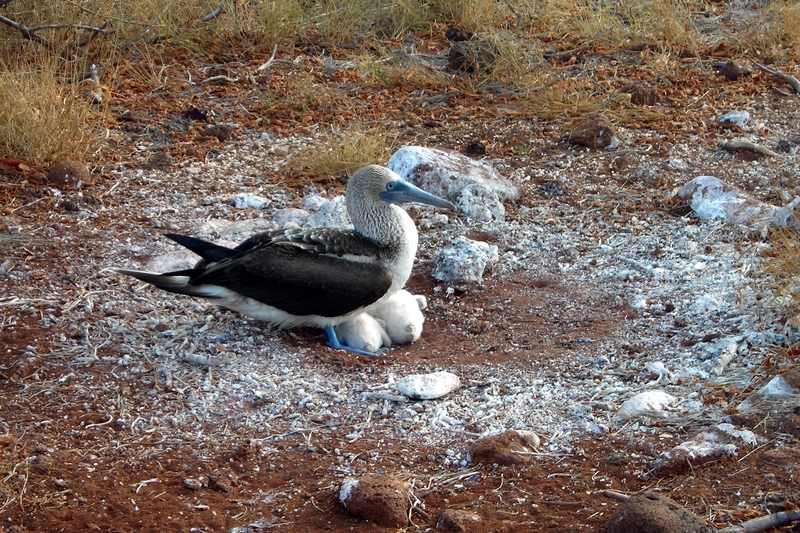 Blue-footed boobies lay typically lay two eggs, a few days apart. You can see the chick on the right (born first) is larger than the one on the left. The second egg is an “extra,” sort of an insurance policy in case the first chick doesn’t make it. If food is plentiful, both chicks will grow and eventually become independent. If resources are scarce, the older chick will use its size advantage to monopolize the food, and may eventually resort to pecking or killing the younger chick. This is called facultative siblicide. Another species of Galápagos booby, the Nazca booby, practices obligate siblicide, meaning that the older chick always kills the younger, and usually within days of its hatching.